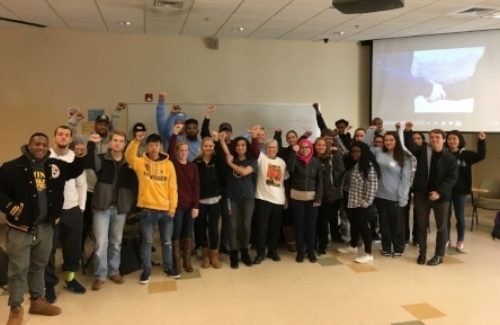 It Is In You projects, led by Marie Garlock, activate more equitable access to health, justice, and community-building in live performances, interactive education, and collaborative research. It Is In You events, courses, and research partnerships connect people to their own bodies and stories, exactly as they are now--a vital act for those of us who face advanced illness, social inequity, or cycles of violence. It Is In You initiatives hope to enliven our curiosity about creativity itself--especially in unlikely places, around taboo subjects, and as led by persons living daily with health and civil rights challenges. Creativity in our stories and bodies can awaken our integrity as both political and playful; it can light up individuals' strengths and manifest in spirited collectivity. Institutions, organizations, and initiatives benefit from strengthened community engagement and inter-professional learning through It Is In You programming. Site-specific content improves communication, inspires participants, and enhances actionable knowledge on health and equity issues.